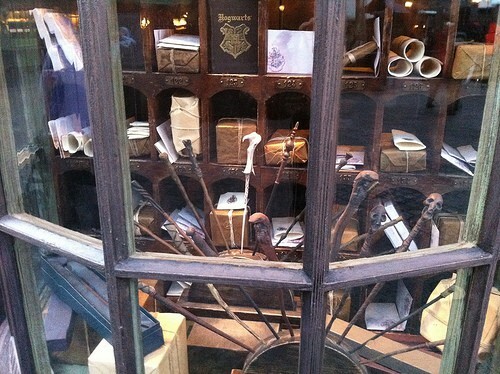 Ollivander’s Wand Shop is one of the most exciting places to visit in Universal Wizarding World of Harry Potter. This is a must see attraction at Wizarding World where guests can participate and watch the Wand choosing the Wizard – just like in the Harry Potter Sorcerer’s Stone movie. There are now 2 locations for the Ollivander’s Wand Shop in Orlando. One is the original one in Universal Islands of Adventure and the other is part of the newer Harry Potter section in Universal Orlando. Which one should you visit? The experience is very similar in both parks so our advice would be to visit the one which fits in more with your other plans for the day. The experience is exactly the same at either park. The store is better in Universal Orlando, but you can go to the store in either park whether you go to the experience or not. Here is a video which shows some of the starts of the Harry Potter movies visiting Wizarding World in Islands of Adventure.Only watch this if you are sure that you don’t want to save the surprise for the actual experience! What will you find inside Ollivanders Wand Shop? You will feel as though you have stepped right into the real wand ship of the Harry Potter movie. Like everything in Wizarding World the attention to detail is amazing. Ollivander’s is a very small space and they only let 25 guests in at one time. The line can get pretty long it does move pretty quickly, and the experience is certainly worth the wait. The first time I visited with my family I had already watched a video which showed the whole Ollivander’s Shop experience. But I made sure that my family did not find out any details prior to our first visit shortly after it opened. I did not want to spoil the surprise for them. So if you don’t want to know more details stop reading now – SPOILER ALERT! When you enter the room the first thing you realize is just how very small the space is! It looks exactly as you would expect Ollivanders to be. There is a desk in front of you and of course Ollivander himself. Having experienced this many times there are definitely some Ollivander Cast Members who are better than others – but all do an amazing job of playing the part. The ceiling is very high in the room, the lighting dimmed and the walls are crammed with wands and magical items. Everyone is encouraged to come forward and then one person is chosen to be the subject of the wand choosing process. How do you get picked? I have observed this many times and there are some ways you can increase your chances of being picked. Obviously being nearer the front where Ollivander can see you is a must. Very young children are never picked. Older children have the best chance of all, and of course anyone wearing Harry Potter themed clothes has a better chance. Having said that it took 7 attempts, yes 7, for my 9 year old son to be picked. During all those attempts his 13 year old sister was picked three times! In fact it does seem that girls may have the edge when it comes to selection. The ‘Chosen One’ is invited to step forward and is taken through the wand selection process by Ollivander. Of course as we know from the Harry Potter Sorcerer’s Stone movie and book this is not a straight forward process and Ollivander does need to take some time to get the right one. The guest is asked a number of questions to find out the best choice of wand for them. There are lots of different consequences of choosing the wrong wand but eventually the ‘right one’ is found for the guest. Of course the next stage is to move out of one of the two exits from the Ollivander Wand Shop experience and you’ve guessed it, into the store selling wands. The person who was selected, and all the other guests can buy their wand of choice. This is the difficult bit. This section is incredibly crowded. The wands are of very good quality and are priced at $29.95 plus tax each. I consider myself pretty good at avoiding the ‘store after the experience’ but this one is very very tempting. You can select from all the main characters wands. Would you prefer Harry Potter, Hermione, Ron Weasley, Snape, Dumbledore, or even Lord Voldemort? 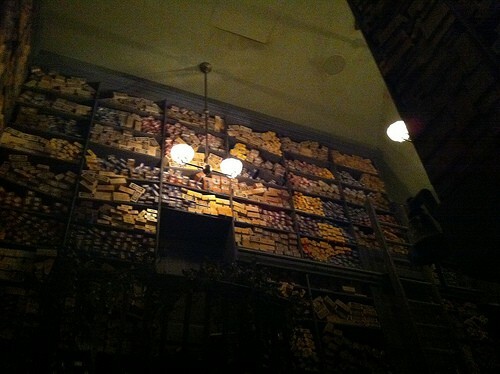 Ollivanders Wand Shop is another must see attraction at Universal Wizarding World of Harry Potter. The only disadvantage is of course the wait. If you can arrive very early in the morning then of course most guests head to The Forbidden Journey or Gringotts first so if you have already ridden this you can go to Olivander’s whilst everyone else is heading to the other attractions.